So sharp looking. 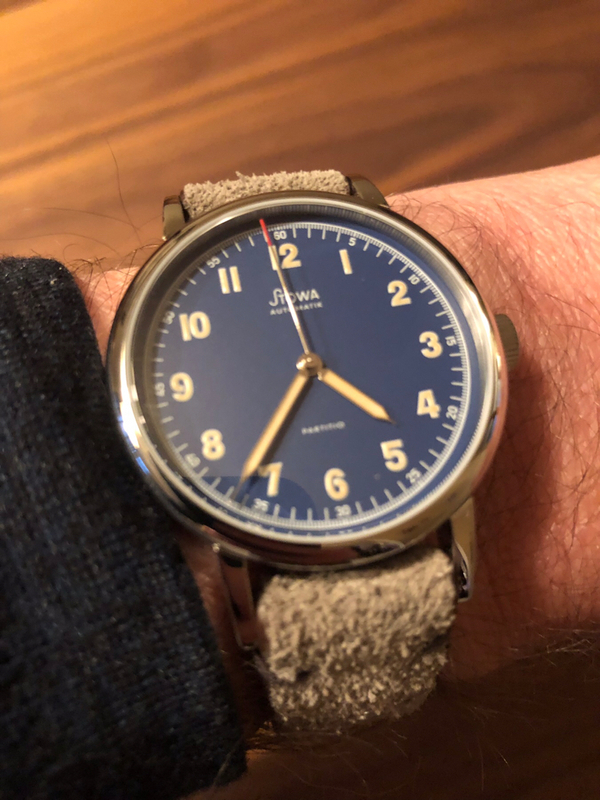 The problem with Stowa, I always start picking out and customizing the watches, next thing I know 6 watches are in my cart! So I've had mine on my wrist solidly for the last week or so, and I have to say this is a great watch. Out of my three Partitios, which are also lovely watches, this has taken first spot away from the white dialled version. I actually like that it's an auto, the smaller sized crown on these watches and the movement used means handwinding isn't quite as pleasant as on some of the larger handwinders (eg the chronos or marine originals). The blue dial is a different shade to the recent LE marines, but works well, and fits with the lume colour too. Slightly lighter and a more saturated blue to my eye. Can't see much if any difference in lume intensity compared to the standard partitios, but I don't tend to rely on lume much. I'm a bit divided on the merits of the red tip to the seconds hand. It does bring a nice splash of colour and differentiates from the standard model. But it sometimes gives the optical illusion that the hand is shorter. The size is obviously familiar, being identical to the regular version. It is a smaller watch, which might put some off. But it does fit the vintage look. If anything, this one feels more vintage in look than the black, despite the black being based on a historical model - go figure! I did ditch the strap quite quickly. It's a nice enough strap and quite distinctive, but probably a bit too casual for me to wear with a suit during the week. So I switched it over for an old dark brown Antea KS strap I had lying around, and that works better for me. The original strap will find a home on something else. Overall though this is a great limited edition, and actually quite a versatile watch. Very pleased with it. Fikk, TgeekB and flaccidaardvark like this. So what is the thought here on a "break-in" period? In all of your experiences, roughly how long before the watch settles into a consistent rate? This is the first watch I have bought new at this price level so I am not sure what to expect. With most movements I don't accuracy check them for the first 30 days, and keep it running continuously for 30 days. Most problems with complications or failures will happen in that time frame. a to the k, infrarot123, flaccidaardvark and 5 others like this. TgeekB, Vetinari67, Bhanu Chopra and 2 others like this. I ultimately decided against it due to my ongoing dislike of beige lume. If this had white lume I'd have ordered one for each wrist! Looks like you got in just under the wire. Website says there are <10 left.